It wasn't the fastest, but definitely the most competitive race in the the 11-year history of the Delioite-Ogier BVI Sunrise Half Marathon, that ended with St. Thomas' Ruth Ann David improving her own course record on Saturday. 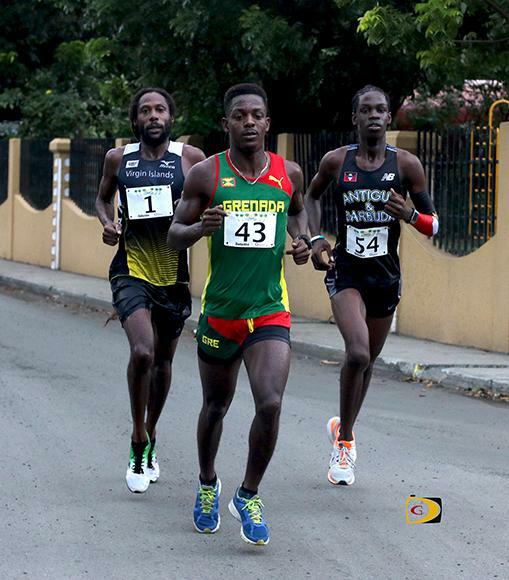 The men's pace was set by Grenada's Renon Radix, Antigua and Barbuda's Kalique St. Jean and the USVI's Shane DeGannes, a 3-peat champion who was second last year, battling over the first 10½ miles, before DeGannes was dropped. Radix and St. Jean dueled for anther mile before Radix went clear for the victory. "I thought the head pack set a decent pace early in the race so it was good going and to the end, I had to work a bit, but it was wonderful," Radix said. "I didn't know the route so I had to bait someone who did and the Antiguan and and I basically stayed with Shane for a while. I knew once you go out and turn, then I would have memorized and mapped the route, because coming back was about six miles. I knew the course then, so it was a bit of waiting, then start injecting a bit of pace and see what they had. It was a cat and mouse game for the last five miles." After dropping DeGannes, Radix said he knew St. Jean is a 5000m runner and the last three miles would be a battle. "I don't know what happened but in the last mile, he just backed off and I took the opportunity to go ahead hard to the finish," he said after running 1 hour 20 minutes and 57 seconds. "It's the first time I've won a race out of my country so I could care less about time. I'm just happy that I won." St. Jean said on the return, the wind was beating in his face and was trying to stay with the pack, execute a good race and finish strong. "My hamstring started to hurt a bit and I slowed because the pace was hot, hot," he said after running 1:21.24. "But, I'm happy with my time. It's a personal best." DeGannes said it was a fast race and was glad Radix and St. Jean came. "We ran about a six minute pace going out, those guys made me do all the work, then dropped like a 5:45 around mile 7, 8, and it started rocking," he said noting he didn't have Gatorade. "It stared getting faster at mile 10, that when those guys started taking off and I just dropped off. Tried my best, but, I couldn't hand on." Julius Farley passed the BVI's top runner Reuben Stoby and placed fourth. "I didn't want the girls beating me today-that was my motivation," he said. "I saw the times they ran which was pretty impressive so I went out and tried my best. I'm surprised and thankful, because Reuben has been beating me all year. After I seized the advantage, I just kept pushing on." Stoby who was with the pack for the first two miles, faded to fifth and held off David by .01 at the line. "I'm disappointed and I wasn't able to keep up after the first two miles-maybe the many races this year took its tool because I ran three minutes off what I ran last year," he said. "I was at least expecting a personal best if not a victory. So I'm disappointed." In the women's race, St. Thomas' David and Grenada's Kinesha Pascal engaged in a duel before the defending champ pulled away to finish sixth overall. "I wasn't sure I was going to get here because I had no money," said an emotional David who crossed the line in 1 hour 30 minutes and 21 seconds to break her course record of 1:30.46 and collected $750 including $250 for taking the record, after an early battle with Grenada's Kinesha Pascal. "I want people to understand how true and how God will be there for you if you just trust in him. Don't trust in people to be there for you, trust in him to see a way and he'll always make a way." David praised Pascal for helping her performance. "If she wasn't here, I think it would have been harder for me to keep my pace in the beginning-she helped me to set a good pace," David noted. "We are running together for about five or six miles and Reuben Stoby too, he also helped." Pascal was happy with her 1:32.37 personal best effort. "It's a great improvement from the 1:37.25 I did at home two weeks ago," she said, which also improved her 1:34.40 best. "It was the second time I'm running with Ruth and the first over Half Marathon. I guess she had a better advantage because she knows the route and it's my first time, but, I'm happy with my performance." Final Results and awards. Men: 1. Renon Radix, Grenada, 1 hour 20 minutes and 57 seconds. 2. Kalique St Jean, Antigua and Barbuda, 1:21:25. 3. Shane DeGannes, USVI, 1:25:28. 4. Julius Farley,1:27:09. 5. Reuben Stoby,1:30:20. 6. Guy Williamson, 1:36:48. 7. Curwin Andrews,1:44:18. 8. Ishwar Persad,1:46:50. 9. Adrian Dale, 1:47:24. 10. Sam Malpas, 1:49:00. 11. Michael Ennis, 1:49:03. 12. Rodrigo dos Santos, 1:49:26. 13. Guy-Paul Dubois, 1:49:26. 14. Richard Morris, 1:50:29. 15. Owen Walker, 1:55:08. 16. Charles Kerins, 1:56:38. 17. Daniel Mitchell, 1:56:55. 18. Richard Morgan, 1:58:59. 19. Aaron Gardner, 1:59:25. 20. Gabriel Obregon, 2:00:49. 21. Patrick Ormond, 2:02:18. 22. Sergio Dantas, 2:02:58. 23. Shane Donovan, 2:03:35. 24. Ray Wearmouth, 2:07:26. 25. Daniel Russell, 2:08:04. 26. Adrian Dawes, 2:10:34. 27. Dennis Versoza, 2:12:37. 28. David Mathews, 2:25:06. 29. Laurent Keeble-Buckle, 2:30:03. 30. Jonathan Addo, 2:30:43. 31. Edward Alvis,2:36:06. 32. Bill Kinkead, 2:37:26. Women: 1. Ruth-Ann David, USVI, 1:30:21 (New course record. Old record, David, 2015, 1:30.46.) 2. Kinesha Pascal, Grenada, 1:32:37. 3. Maria Mays, 1:41:27. 4. Lisa Parfitt, 1:51:43. 5. Melisande Rowe, 1:57:09. 6. Rosmond Johnson, 1:56:05. 7. Katrina Lindsay, 1:58:42. 8. Claudia Ferrari, 1:59:11. 9. Elsa Fonseca, 2:00:21. 10. Gillian Plaxton, 2:01:08. 11. Rachael Mayo Smith, 2:01:46. 12. Becca Knight, 2:02:28. 13. Kay Reddy, 2:09:16. 14. Jenny McIvor, 2:09:49. 15. Janet Lewis, 2:13:17. 16. Deborah Bell, 2:13:36. 17. Anna Kinkead, 2:16:46. 18. Karrina Stead, 2:19:32. 19. Casey McNutt, 2:19:39. 20. Richie Paul, 2:20:51. 21. Rachael Matthews, 2:22:27. 22. Geri Dawes, 2:22:37. 23. Natasha Ruscheinski, 2:23:54. 24. Kerry-Ann dos Santos, 2:23:54. 25. Natasha Gunney, 2:24:05. 26. Laura Malpass, 2:28:30. 27. Simpa Ganadillo, 2:37:26. 28. Brenda Pickering, 2:37:50. 29. Barbara Pinnock-Smith, 2:38:05. 30. Candace A Grant, 2:38:06. 31. Nedy Ador Dioncio, 2:43:30. 32. Claire Santillan, 2:57:13. 33. Ryan Wendt, 2:57:40. Women Power Walker: 1. Lisa Bridson, 2:48:21. 2. Shirley Liburd,3:24:21. 3. Sheron Griffith, 3:35:18. 4. Nerissa August,3:35:18. 5. Kelly Smith,3:37:05. 6. Patrice Miller,3:37:05. Veteran male: Curwin Andrews: Female: Kay Reddy. 2. Rawlinson & Hunter/Ogier, (Rebecca Clark, Clifton Struiken, Derek Rawlins), 1:44:27. 4. Runs & Poses - KPMG 1, (Jacques Roux , Lovat Carnelly, Steve Langford), 1:51:35. 5. BDO (Krystal Blackman, Guyp DuBois, Ryan Geluk), 1:56:51. 6. Harneys 3 (Jonathan Addo, Stuart Cullen, Tate Gotosa) 2:11:58. 7. Deloitte (Natasha Rusheinski, Aurelie LeGangneux, Martin Perez), 2:27:40. 8. Baker Tilly (Laurent Keeble-Buckle, Hadley Chilton, Kara McCracken), 2:32:56. 9. Harneys 2 (Rahel Worde, Nadine Joseph, Joanna Hossack), 2:54:35.13. 1. JulesSmith (Chris Smith, Julianne Potgieter), 1:45:24. 2. Brute Squad (Paul and Anjali Mellor) 1:48:42. 3. Tek Dat (Julien Johnson, Adenike Secard, Marvin Flax) 2:08:58. 4. The end of the Boks (Johnnie Bailey, Cayley Smit) 2:15:36. 5. Big Mac (Nylross Jalova, Ravenal Santos, Mitchelle Fos) 2:25:50. 6. Tap it and Run (Ryan Wendt, Odalis Peña) 3:03:41. Best Water stop - Claire "Turn Point" Burke, Honourable Mentions: Ogier (Music), Sensus (Toga Party), Deloitte (electrolytes! )/VISAR.